Each river has a story. And, more often than not, great stories have a river. There’s a lot of great river books and movies out there—from classics like Heart of Darkness to novels-turned-blockbuster hits like The African Queen. But with so many superstars, incredible river books can fall through the cracks. Scroll on down to discover 10 must-read river books that you’ve probably never heard of… but will be glad you found. P.S. We even threw in an extra book close to founder Peter Grubb’s heart written by a distant cousin in the early 1900s. The river is strong in the Grubb family! 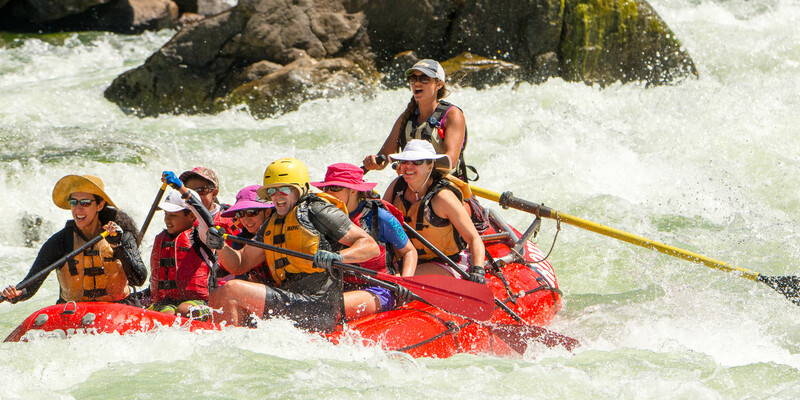 Carrey and Conley’s The Middle Fork: A Guide is not your typical river guide. Written as a preservation of the past, The Middle Fork is a historical guide rather than a technical one. If you’re hoping for a step-by-step blueprint for getting down the river, this river book isn’t for you. Instead, Carrey and Conley do one better and enrich the Middle Fork’s invaluable heritage rather than capitalize on it. Carrey and Conley breathe life into the river’s past with stories of the explorers, Native Americans, homesteaders, ranchers, miners and boatmen whose presence form an indelible connection with the river. The 220 stunning photographs are pleasing to the eye. The Middle Fork also delves into the hot springs, forest fires, archaeology, name origins, campsites, maps, geology and rapids of the central Idaho river. In this masterpiece of travel writing, William Least Heat-Moon sets off in his van named “Ghost Dancing” in search of blue highways: the most obscure and rural of rural roads to be found along the border of the Lower 48. Along the way, Heat-Moon finds himself on a road trip to self-discovery, one riddled with quirky conversations and whimsical anecdotes. From his experiences, Heat-Moon creates a hippie-esque elegy to the shrinking of rural America that gains new resonance with the modern generation in a world of increased global interconnectivity. Rich in both soul and detail, Blue Highways is a worthy read that gives the phrase “the road less traveled” a whole new meaning. Life on the Mississippi may not have Huck Finn paddling down a river, but it does have Mark Twain’s river exploits in this interesting portrait of America. Twain’s autobiographical account of his early days spent as a Mississippi steamboat pilot’s apprentice intersperses entertaining reminiscent, historical, sociopolitical and geological expositions along with the witty, satirical ‘yarns’ Twain earned a name for. In the latter half of the book, Twain returns to the river as a passenger and switches narrative gears as he muses over the changes in the steamboat industry, the industrialization of post-war America and the changes he can see in Mississippi’s shores and people. In many ways, the book itself is reflective of the Mississippi: a meandering tale at times thrilling, at times placid, full of deep musings and shallower quips. Mark Reisner tells the story of the American West as a different kind of pilgrimage: one in search of water rather than land. An exposé into the history of rivers dammed, diverted and devastated by environmental changes, Cadillac Desert illustrates impeccable research and an undeniable investigative ethos. Though Reisner explores the role water played in the history of the American West’s desert landscapes, he zooms in on the efforts made moving water to California. Originally published in 1986 and revised in 1993, Cadillac Desert may no longer seem as uncannily prophetic as it once did, but it remains relevant to today’s water crisis and is a thought provoking read for any river-lover. In a rich collection of photographs and essays, Tim Palmer’s Rivers of America explores the vibrant relationship between mankind and rivers. Palmer, an explorer as well as a conservationist, writer and photographer, has rafted and canoed down nearly 300 rivers. Drawing from those experiences, this book is more of a love story about mankind’s innate connection to flowing water than your standard photo-filled coffee table book. Though Rivers of America ultimately retains its hopeful pathos, Palmer also explores the presence and repercussions of pollution and damaged ecosystems on the rivers he loves. With over 200 stunning photographs and engaging musings, there’s plenty to enjoy here for both the casual and dedicated river-lover. Collins and Nash give you the whitewater rundown of some of North America’s notorious “Big Drops”: the best, most classic and potentially breath-stealing rapids of them all. The Big Drops’ examination of 10 major rapids goes beyond a technical manual of running each rapid. Rather, look forward to discovering the evolving geographical, historical and ecological context of each rapid and their intangible, demanding presence on the river. The Big Drops remains timeless to this day and includes iconic rapids such as Hell’s Half Mile, Lava Falls, Satan’s Gut and more. Stephen Ambrose’s Undaunted Courage may not be as obscure as the other books on this list, but few consider it a “river book.” However, as our Missouri River Canoe Trip: A Lewis & Clark Expedition tour testifies, the Missouri was truly a journey of discovery for explorers Lewis and Clark—a river whose waters saw many significant events in America’s history as well as the return journey of Lewis and Clark. Ambrose’s Undaunted Courage strays from the winding path of the Missouri River and stretches further into the banks of the American West as Ambrose details the launch of the epic expedition as well as the many travails, discoveries and cultural encounters Lewis and Clark met with during their travels. While Ambrose’s research is evident, he doesn’t weigh the text down in esoteric or colorless information. Instead, Undaunted Courage tells the bittersweet tale of Meriwether Lewis and other primary players such as Thomas Jefferson and Sacajawea with all of the passion and vivacity they deserve. Alan Moorehead gives a thrilling account of the 19th century search for the source of the White Nile in this novel-like narrative that’s well researched and filled with all of Africa’s major explorative players. Moorehead covers a lot of adventure ground with stories of Richard Burton and Speke, who disputed whether Lake Victoria served as a source of the Nile; Charles Gordon, who attempted to govern the Sudan; the humanitarian David Livingstone and Henry Stanley; Baker and his young, Victorian-skirt clad wife Florence Ninian von Sass; General “Chinese” Gordon, who later became known as Gordon of Khartoum; and an array of others from missionaries to local rulers and Italian explorers. Africa’s slave trade remains a major narrative thread throughout Moorehead’s colorful collection of stories. Though Moorehead takes a largely British position, constricting the focus of his research and his take on the emergence of colonialism, The White Nile provides a thoughtful, engaging account of African exploration. Companion to The White Nile, The Blue Nile centers around the stretch of river known as the Blue Nile. Rather than focus on the intrepid explorers themselves, however, Moorehead delves into the clashing of civilizations and ideologies and the roots of globalization. Though you can look forward to seeing iconic historical figures such as Napoleon, they largely serve as reminders for larger forces at work. As such, rather than a collection of thrilling adventures, Moorehead surveys the advancement of Western advancement in a disappearing world of isolation and wilderness. Though The Blue Nile’s scope is much more expansive than The White Nile, it retains Moorehead’s signature eye for sociological and natural detail as well as his ability to capture the story in history. F. W. Up de Graff;s compelling account of his time exploring the Peruvian and Ecuadorian Amazon takes the reader through exotic, deadly forests and down the Upano, Napo and Yasuní rivers. Up de Graff, an engineer from New York, found himself in South America with high hopes to make it as an entrepreneur. His true Amazonian adventures began, however, with a detour to meet his ship home—a detour which ultimately lasted 7 years. Beyond Up de Graff’s environmental wanderings, he meets with a range of peoples such as rubber-tappers, gold-diggers and indigenous Amazonian head hunters. Not a scientist or a naturalist, Up de Graff is more of a man “possessed by the spirit of the wilderness,” and as such his observations take on a decidedly romantic, sentimental, bent sure to make you dream of the Amazon. Written by ROW founder Peter Grubb’s distant cousin, Sir Kenneth Grubb, Amazon and Andes details Grubb’s time spent as a missionary with the World Dominion Movement in the early 1900. Grubb’s missionary work took him through South America’s Andes and upper Amazon and down the Marañón River. What River Books Are On Your Must-Read List? Editor is an amazing group of people consisting of the ROW Staff - you'll see them write about a variety of things from river life to cuisine.